The month before Christmas, Ben asked me if I wanted to do a trip for my Christmas gift, like we did last year. Last year, we took a four day get-away where we went antique shopping. I thought about it and told him that really, all I wanted for Christmas was a staycation where we painted my kitchen cabinets. At our last house, I was able to do a lot of renovation projects with the girls around. 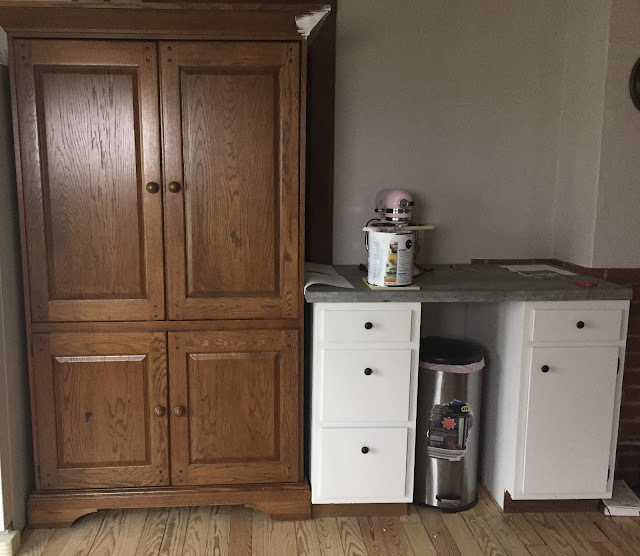 But with the addition of homeschooling plus another daughter, plus our garage/workshop is unattached to the house, it has been harder to do renovation work here. So I just wanted a few days without the girls where I could paint my kitchen cabinets! 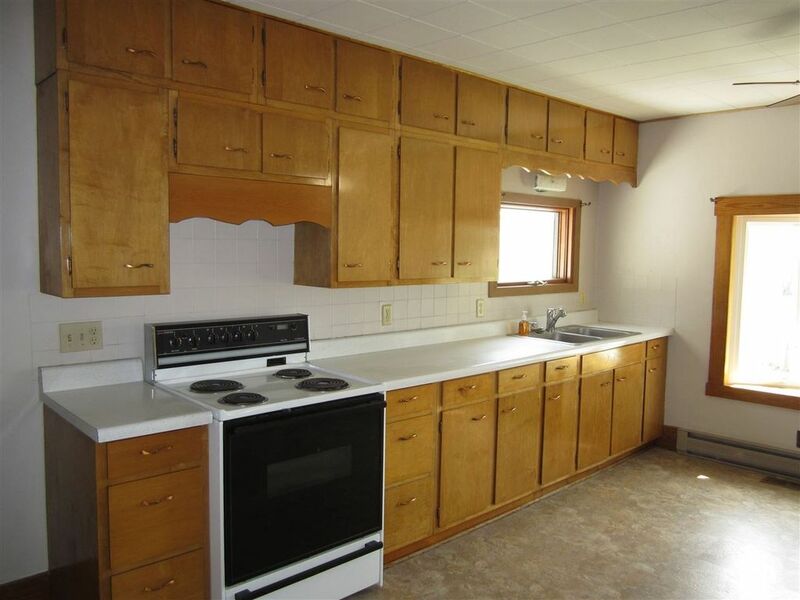 The kitchen was in decent shape, but just very dated. I was content in it, but painting is such a simple and cheap upgrade. So, during the first week of January, we sent the girls off to their grandmas' houses (thanks Grandmas! ), and we got to work on the kitchen! Here is what our kitchen looked like before we started working on it. Here is another before, from a different angle. We moved the fireplace to the living room. We love the antique fireplace, but it seemed more fitting in the living room than in the kitchen. We haven't hooked it up yet, so we are not currently using it, but we hope to by next winter! 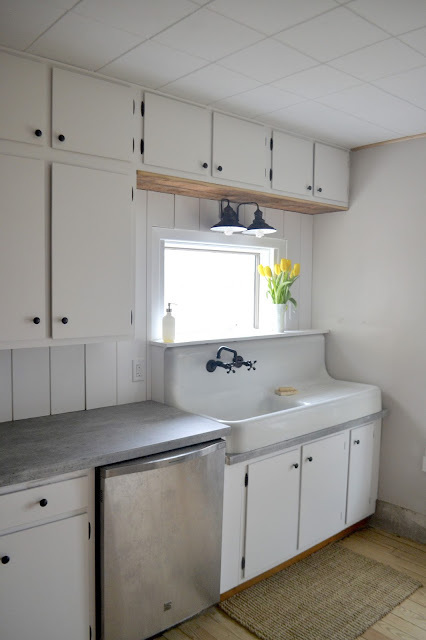 I painted the cabinets a light creamy gray and we bought new hardware, and then my husband said, "We might as well get new countertops while we're at." I wasn't going to argue with that! 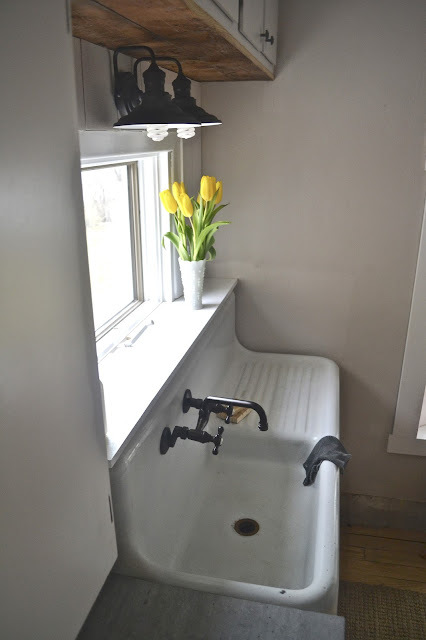 I really love the concrete look, so we considered doing concrete over the existing laminate, DIY-style. We opted, instead, to buy laminate that looked like concrete. It wasn't much more money to do so, and DIY concrete is messy. Additionally, people with concrete countertops say that they can be high maintenance, with water marks and oil marks being unavoidable. 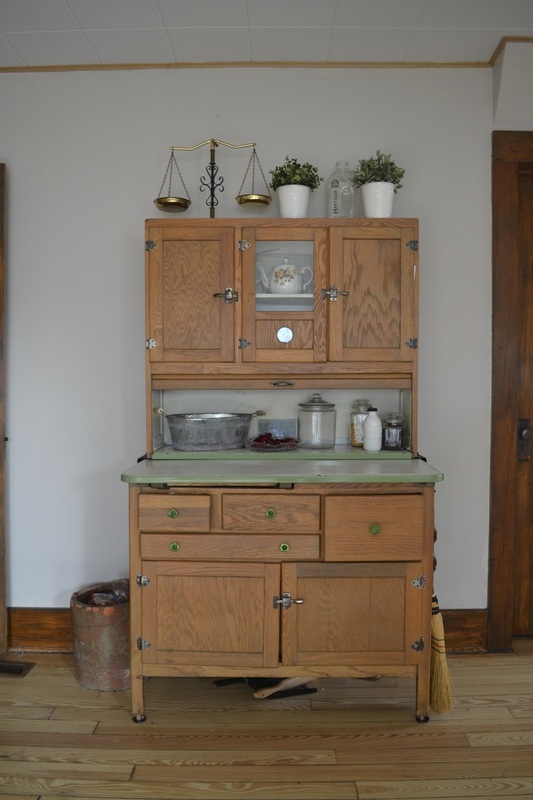 In our last house, we installed butcher block countertops, and we loved them, but every cup that was set on them left a water mark, and I hated having to constantly stay on top of my children and even guests about babying them. I wanted something much more low maintenance in this stage of our lives with young children and also with the desire to host. My husband then said we might as well pick out a new sink too. I was really feeling like we were on a good roll at this point! (What else should we get, dear?) I actually did decide to take advantage of his willingness to upgrade the kitchen. We originally planned to just get a standard, black, granite sink. 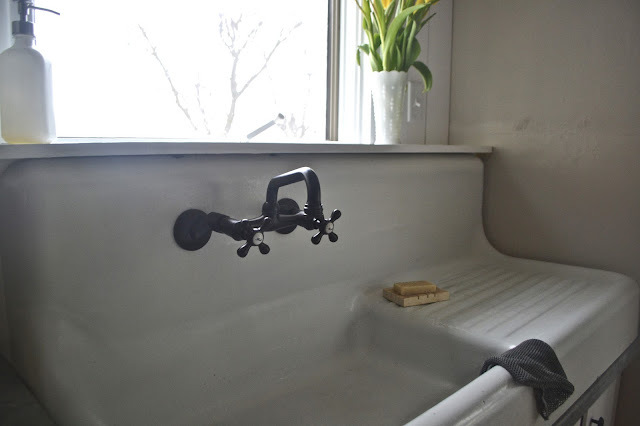 I couldn't shake off the fact that the standard black sink didn't seem authentic to my 1930s farmhouse kitchen. So, I started doing what every good housewife does. I started searching on Craigslist. 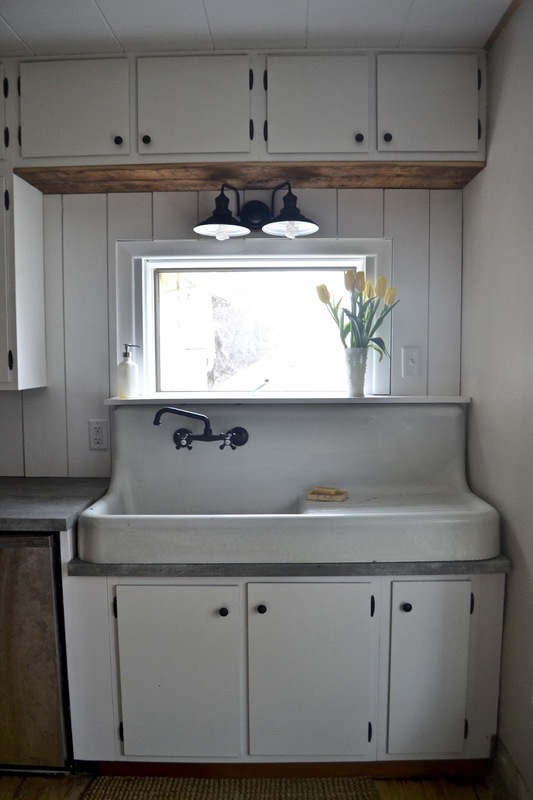 And I found this gorgeous antique farmhouse sink that was just two hours away and was listed for right around $100. I couldn't get it off my mind for several days, so I called them, and they still had it! So then I brought it up with my husband. He was not so keen on the idea at first. 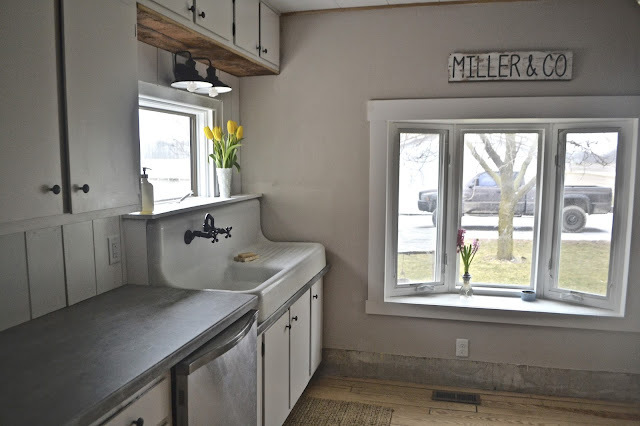 It would mean more work for him, and it would certainly be more difficult since we had already ordered our countertops at a particular length. 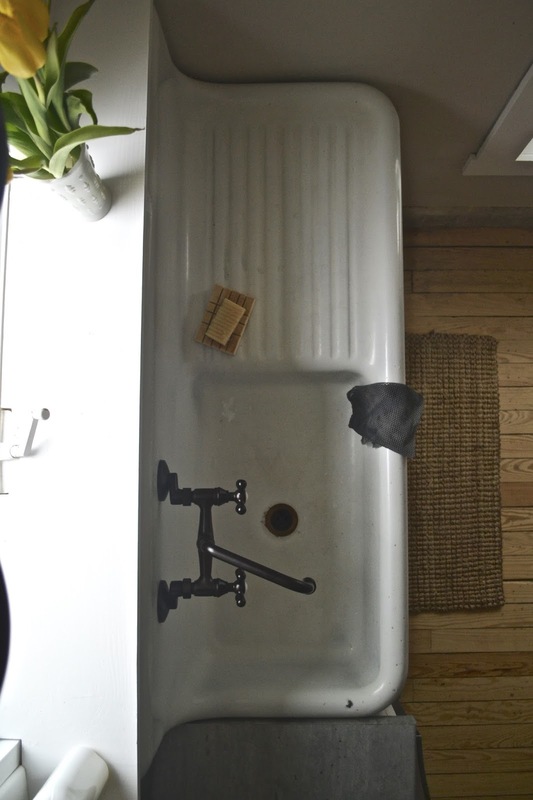 I told him that while I liked the sink, I only wanted to get it if he was interested in it as well. And I meant that. He thought about it and decided that we should get the sink. And would you look at this beauty! 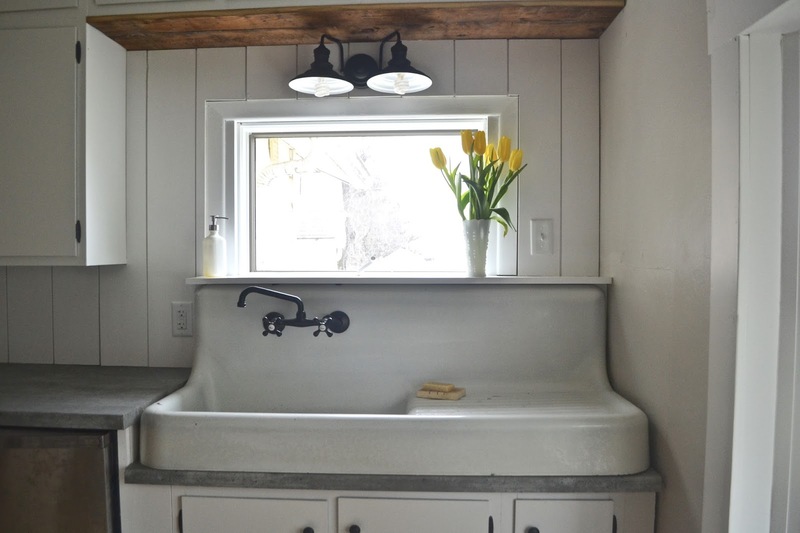 Hubby says he's glad we went with the farmhouse sink, as it definitely defines the kitchen. It adds character, and it's fitting to the age of our house. 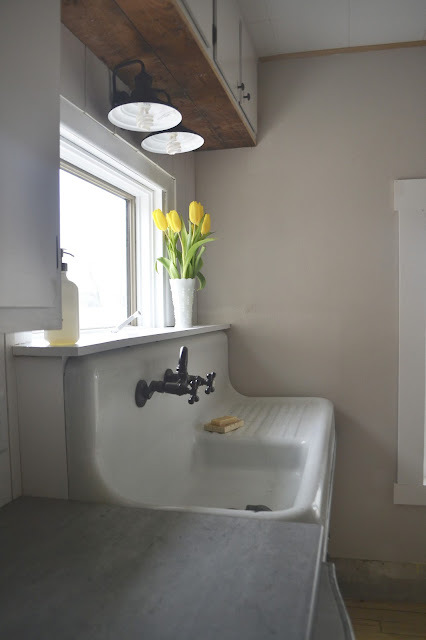 We debated about whether to put the sink up front, where we would have to build a ledge behind it, or to set it back more, so that the high back on the sink fit to the wall. At this point, I did the second thing that every good housewife does... I perused Pinterest and Instagram like it was my job, and finally landed on preferring the sink to be flush with the lower cabinets, with a ledge built behind. I'm so happy with my decision! I love my ledge. On the wall opposite of where the sink sits, we have the refrigerator, pantry cabinet, and a few extra lower cabinets with a countertop. There is an old doorway behind the pantry that we plan to close in with drywall at some point. This door leads to the living room, but there is another door that leads to the same area that we use rather than this one. 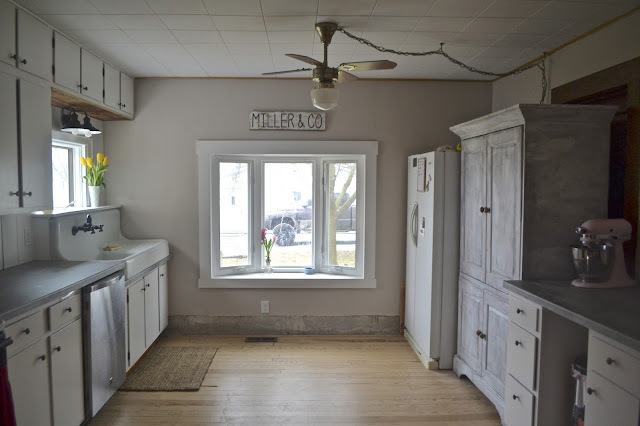 I plan to have my husband put up a few open shelves above the countertop area. Here's the pantry cabinet before. 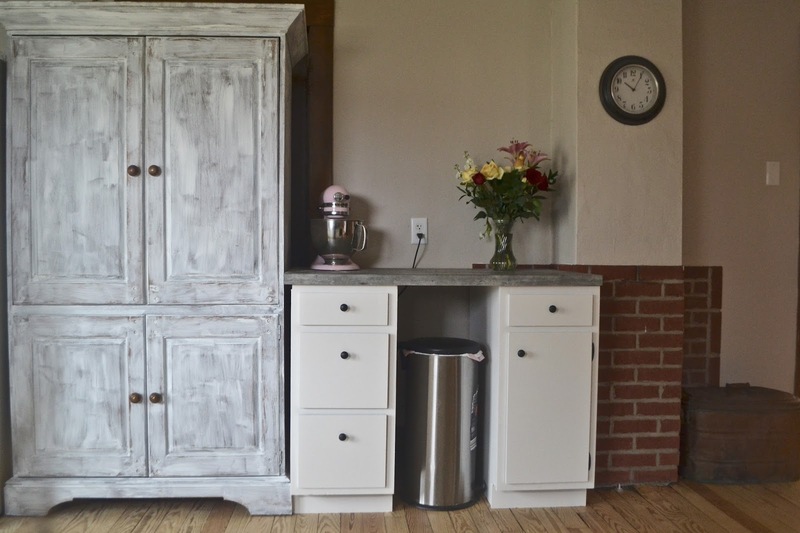 I put deglosser on it, and then simply painted one layer of white paint on and sanded it down to give it this rustic whitewashed look. Cabinet Paint Color: Valspar Signature's "Snowed In"
Wall Paint Color: Behr Marquee's "Cappuccino Froth"
Backsplash: Shiplap painted in Valspar's "Snowed In"
What a great Christmas present! It looks great and I wouldn’t have guessed the countertop is laminate. We’re currently working out the kitchen in our 70s cabin. So fun, Richele! I would love to see pictures sometime! I love your updates. I sat by you at the Charlotte Mason Soiree Retreat in Mississippi, but like a dummy I didn't introduce myself. I love following you on Instagram. 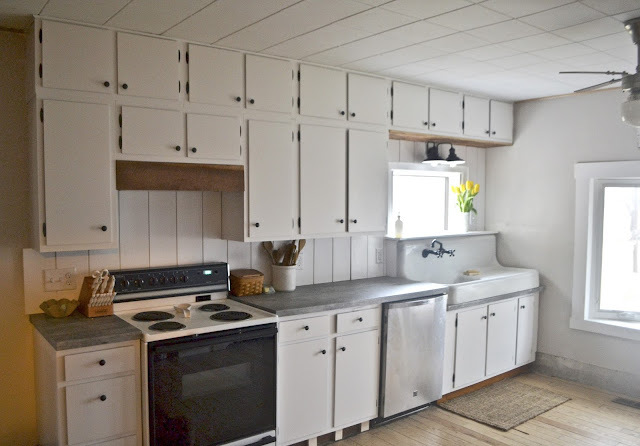 I too just remodeled my kitchen in TN so I understand completely about never being quite done. Hi Rebecca! Thanks for leaving me a comment! What workshop did you sit by me at?! Aw, I wish I would have known! It was SUCH a good retreat! Having a remodeled kitchen is so nice! But yes!! the never-ending loose ends to finish up!